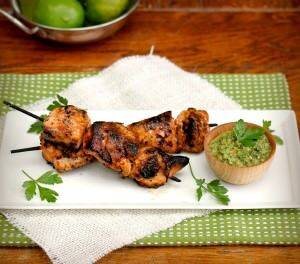 Soak the skewers in water as you prepare the food. In a small bowl combine the orange juice, lime juice, oil, chilli powder, garlic and adobo sauce. Add the chicken and marinade in a zip lock bag, mix well and leave to marinate in the fridge for 1 to 4 hours. When the chicken in ready, thread it on the skewers and season well with salt and pepper. Heat and oil a grill or fry pan. Cook off each skewer until browned and cooked through.